Following an informal encounter with US President Donald Trump, Colombia’s government has criticized opposition leader Alvaro Uribe for allegedly lobbying partisan and not national interests in the United States. Former President Andres Pastrana (1998-2002) announced over the weekend that he and former President Alvaro Uribe (2002-2010) had met with Trump at his Florida holiday resort. The alleged meeting came before a planned meeting between the US president and his Colombian counterpart Juan Manuel Santos. The informal encounter upset the administration of President Juan Manuel Santos as both Pastrana and Uribe are fierce opponents of an ongoing peace process in their country. Uribe’s alleged lobbying in the US is a major inconvenience for the government, which has yet to hear whether Trump will keep the promise of his predecessor, former President Barack Obama, to financially support the costly peace process. 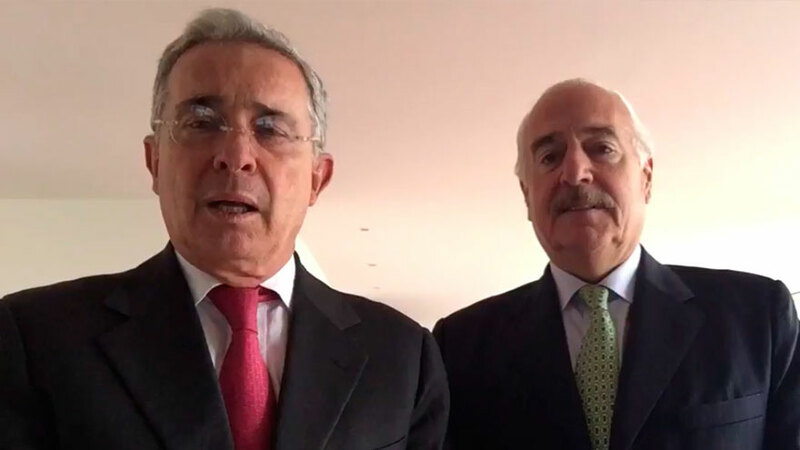 According to Vice-President Oscar Naranjo, Uribe and Pastrana may have overstepped their faculties if they promoted their political interests rather than Colombia’s national interests that are defined by the government. “Presidents and their foreign ministers are those who really establish and maintain these relations” with foreign governments, Vice-President Oscar Naranjo told Blu Radio Monday morning. Colombia’s ambassador in Washington, Juan Carlos Pinzon, implied Pastrana and Uribe had inflated the significance of the meeting. “There was an encounter, not a meeting or a formal date,” Pinzon said. Uribe and Pastrana have increasingly taken their opposition to the peace process to the United States, the only country that has yet to confirm financial aid for the peace process. Only last week, senators of Uribe’s hard-right Democratic Center party wrote a letter in which they asked the US to not financially support the peace process. On Sunday Uribe published a letter to US Congress on Twitter, warning that the efforts to end 52 years of political violence could lead to Colombia becoming an authoritarian communist state similar to Venezuela. Additionally, the former head of state claimed that the transitional justice court that could try him for a number of war crimes is being set up by communist sympathizers. It is uncertain whether the written letters were actually sent. Uribe’s tweeted letter, for example, did not tag the US legislative branch, meaning it is hardly likely the Easter Sunday tweet had much impact in Washington.